With student loans now safely in the bank, students are rushing to the high street to fritter away their cash on a brand new wardrobe, only to find four other course mates wearing the same outfit the next day. To avoid this awkward fashion faux pas, why not check out Brighton’s vast vintage scene? Vintage fashion is constantly influencing mainstream brands, with imitations of old styles becoming increasingly popular. With renewable fashion being so attainable, why not pick up the genuine article for a similar price? There are many boutiques specialising in one of a kind pieces dotted around the city, but one event brings all of the top dealers from around the country together. Frock Me! 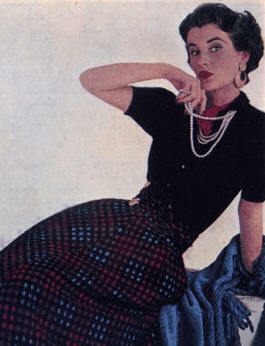 is the hottest London event for vintage fashionistas, which took up residence in Chelsea in 2004. The man behind it all, Matthew Adams, who has been selling all things vintage since 1979, now also hosts a number of fairs in Brighton. We went along to the Brighton Dome Corn Exchange this month to see what this retro fashion craze was all about. A maze of vintage delights, showcased by a number of boutiques and online retailers, left us spoilt for choice, and we quickly began to rummage through the rails. From antique jewellery to vintage Dior there was something from every era to suit any budget. Many things took our fancy, but when we stumbled upon a stunning 80’s fishtail frock in cobalt blue, we immediately fell in love. We rushed to try on the dress, from Snaffle Vintage online boutique, and were astonished to find that it fit both of us perfectly. We were equally impressed by the reasonable price, and as we were both so attached to it, we decided to share it and split the cost in true student style.